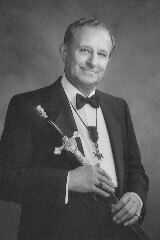 Sir Daniel J. Kavka, Sr., Knight in the Papal Order of Saint Gregory the Great, Cantor-Choir Director and Educator in the Philadelphia area for 58 years passed away on July 28, 2005 due to cardiac complications. Born in Pittston, Pennsylvania, he matriculated in Illinois Benedictine University where he earned his Bachelor of Arts degree in Philosophy and Education, after which he entered Saint Procopius Seminary for two years of Theological Studies. In the footsteps of his father, he assumed the profession of Cantor-Choir Director at Holy Ghost Byzantine Catholic Church, 24th and Wolf Streets, Philadelphia in 1947. Upon his arrival in Philadelphia, he also immediately enrolled in a four-year course at the Philadelphia Music Academy (Conservatory) in Music Education with Practice Teaching at Saint Joseph's University as well as furthering his vocal studies at Temple University. Having received his Pennsylvania Professional Teaching Certification, in conjunction with the Cantor-Choir Directorship at Holy Ghost, he joined the faculty of Saint John Neumann High School in 1956 as Chorus Director, Literature, and English Teacher. He retired from this entity as Chairman of the Fine Arts Department in 1991 after 35 years of educating the youth of the South Philadelphia area. In a spirited outgrowth of heritage and endeavoring to keep alive his Slav culture, Mr. Kavka formed a balalaika ensemble and youth dance troupe, along with instrumentalists in 1974, to more richly depict the musical roots of Holy Ghost Church. The repertoire of the choir and dance troupe gradually expanded to include music and costumes identifying with those of the Czech Republic, Slovakia, Russia, Georgia, Hungary, Croatia, Poland, and the Ukraine. Under his direction, the choir produced eight long-playing recordings, cassettes, and compact discs featuring the Liturgy of Saint John Chrysostom in Slavonic and English; Byzantine Lenten, Easter, Christmas, Marian, and Eucharistic songs of praise; and ethnic folk tunes. Additionally, two VHS Video Productions were produced: one a presentation of the traditional Christmas Bethlehem Carolers - a Bible/Mystery Play depicting the shepherds of the old first encounter with the Christ Child, featuring a four-part male chorus - the second, a 90-minute VHS Video of the Byzantine Divine Liturgy sung in Church Slavonic with four concelebrants. The Chorus and Dance Troupe appeared at Robin Hood Dell, various colleges and universities, theatres, hotels, radio, and television. They also presented concerts at the New York World's Fair, as well as throughout the states of Pennsylvania, New Jersey, Connecticut, Maryland, Washington, DC, and Florida. The group was recognized, not only for their enjoyable performance, but also for the enthusiastic dedication to their heritage. Mr. Kavka was a member of numerous national music and educators' associations, a 4th Degree Knight of Columbus, and was appointed to the Inter-Eparchial Music Commission of the Byzantine Metropolia of Pittsburgh. His many testimonials and awards over the years included that of the former Mayor of Philadelphia, Wilson Goode, who said: "I know that your exceptional choir has spent many hours in practice, and certainly, it takes a special person who has earned the love and respect of others to inspire such a collective commitment to excellence." As commissioned by his Bishop, the Most Reverend Andrew Pataki, Mr. Kavka wrote the music used for the Divine Liturgy of the Pre-Sanctified Gifts. In 1988, he was recognized for his dedicated service to the Byzantine Catholic Church and solemnly invested as a Sir Knight in the Papal Order of Saint Gregory the Great (KSG). It was noted, "The Choir of the Holy Ghost Church of Philadelphia has helped many to appreciate and understand the beauty and traditions of Byzantine Liturgical and Folk Music." Among the extracurricular positions held by Mr. Kavka over the course of the years were: Director of the U.S. Naval Hospital Staff Chorus; Director of the Male Chorus in the Order of Elks; teacher in the Diocesan School of Cantors; and adjunct professor at Philadelphia Community College. With his congenial personality, dedicated enthusiasm, vocal talent, and unique leadership skills, Mr. Kavka became the longest-serving Cantor at the Holy Ghost Byzantine Catholic Church, having completed 58 years of service. When asked what he enjoyed most about the teaching profession, he would answer: "I receive a great thrill, especially in music, when a new song comes together harmoniously. Like a designer fitting the pieces together to make a fashion statement, I feel as if I have woven a 'garment of sound.'" Mr. Kavka made his home in Rose Tree-Media, Pennsylvania and is survived by: his wife, Olga (Karol) Kavka, of 55 years; daughters, Georgette (Michael) Kandrak; Paulette, and Andrea White; a son, Daniel Jr. (Chrissy); grandchildren Timothy, Nicholas, Danielle, Rebecca, and Dylan; and two sisters, Eleanor Sim and Mildred Nissen, both of Pittston, Pennsylvania. Memorial contributions may be made to Saints Cyril and Methodius Byzantine Catholic Seminary, Pittsburgh, PA or to the Holy Ghost Byzantine Catholic Church Scholarship Fund, Philadelphia, PA.